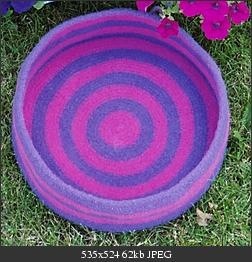 We’ve previously posted adorable pet beds, including my favorite felted crochet cat basket. 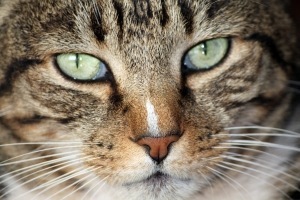 Cats always sleep, but this is the time of the year that your dog night’s sleep could do with a little more comfortable and cozy. When I saw this quilt I instantly fell in love and wanted to adopt one. This quilted pet bed is designed so that it will fit your dog or your cat, no matter how large or small. Making your own dog bed is actually a pretty cheap solution. As well, as this adorable chocolate darling illustrates, it looks like one of the best dog beds out there. This bed appears a bit over-sized. 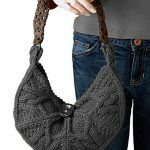 If you make a more snug fitted version, it could place the bed in a round wicker basket. Quilts aren’t just for people anymore! And this is the proof …. 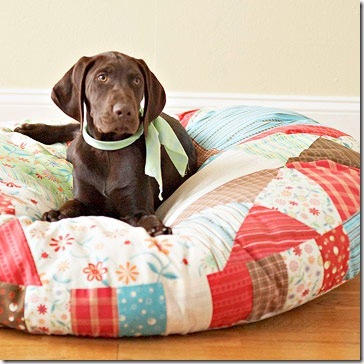 Enjoy this free dog bed sewing pattern! 1. Measure the diameter of a circular pet bed insert. 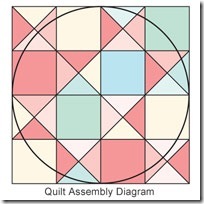 Add 1 inch for seam allowances and make a circle pattern this size. 2. You’ll need to determine how many blocks to create. 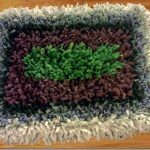 Use this formula to determine how many 3-1/4-x-5-1/2-inch rectangles you’ll need: pet bed diameter in inches x 3.14 divided by 2.75 inches (round up to nearest whole number). 3. 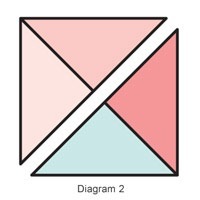 Assemble and join enough hourglass blocks and solid squares to equal the circle pattern. 4. Cut one circle each from the pieced fabric and a coordinating backing fabric. 5. Join rectangles to make a pieced strip, then join ends to make a circle. 6. Sew pieced circle to the pet bed circles with a 1/2-inch seam allowance, inserting a long zipper in the bottom seam to make the cover removable for washing. Use the same pattern, just make a smaller version. Also see our seriously cute crochet cat bed. It has upright sides that your cat might find snuggly: Free crochet pattern for cat bed. 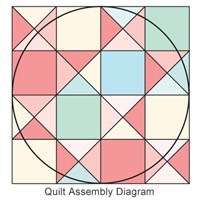 We just started a new FREE online quilting class for beginners. 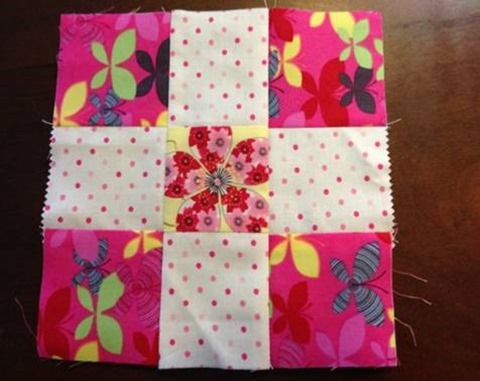 Here’s the first class: How to Make a Cute Quilt, with Fussy Cutting. No sign-up required. 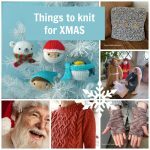 Just craft along… Join in!